There are a lot of ambitious projects which can be done to promote vocations within your ministry: a “Called By Name” campaign, a “Traveling Vocations Chalice” program, or a “Melchizedek Project” discernment group are all effective ways to encourage vocations. But they can take time, resources, and a lot of help. Keep in mind that there are also plenty of small, relatively easy ways to keep vocations on the minds of discerners and parishioners that are free to implement and can be used year-round. Prayer Before Parish Gatherings. 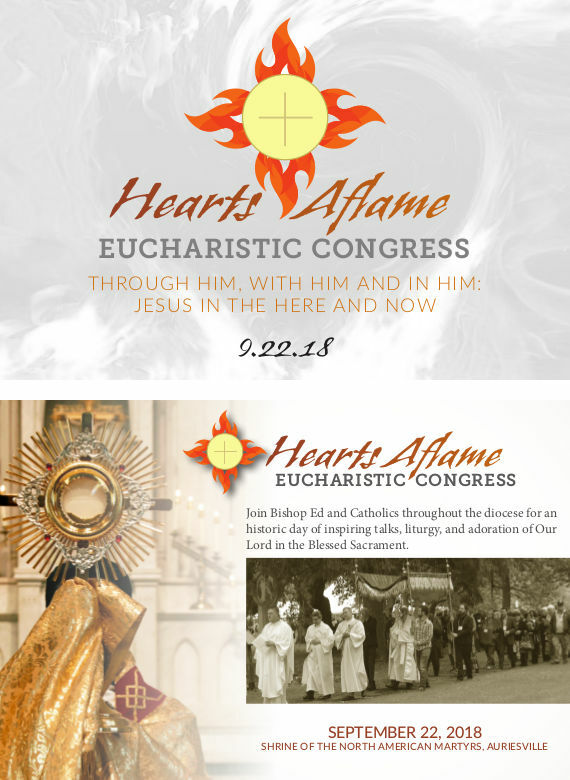 Before any parish or school gathering—committee meetings, banquets, sporting events, anything!—include an intercession for the young men and women who are discerning vocations to the priesthood or religious life, especially from your parish. The Seminarian Poster. Be sure to display our seminarian poster where people can see it! Not only are parishioners encouraged to pray for the seminarians, but it also helps young men to see that their peers are discerning a vocation to the priesthood. Rosary for Vocations. Whether it’s a group rosary before daily Mass or a parish-wide event, dedicate a rosary for vocations, or a rosary for the priests in your life. If you have a regular parish rosary, dedicate one decade to prayer for vocations. Mention Seminarians in your Bulletin. If there’s a seminarian or religious from your parish, keep everyone updated on what’s happening with him in the bulletin; “Brian left Friday for seminary, keep him in your prayers,” etc. Get teachers and youth ministers involved. 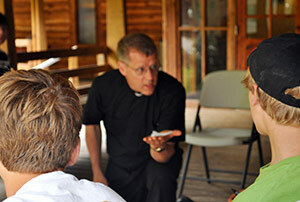 Make sure parish youth ministers and educators keep vocations in mind when working with youth. There's a vocational aspect to every activity! Just implementing a few of these ideas produce good effects to help build a “Culture of Vocations” at your parish! 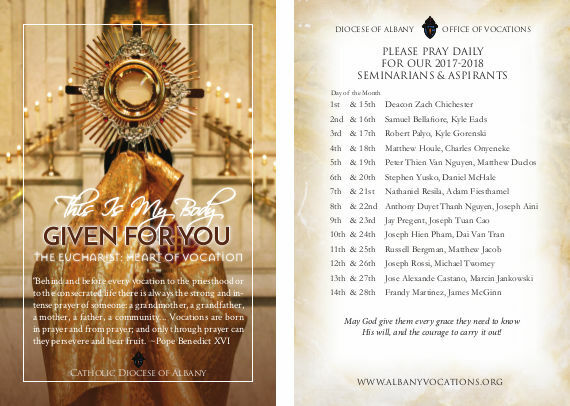 As we begin 2018, I would like to update everyone on the state of Vocations in the Diocese of Albany. Currently we have 108 men on our Discerners List. 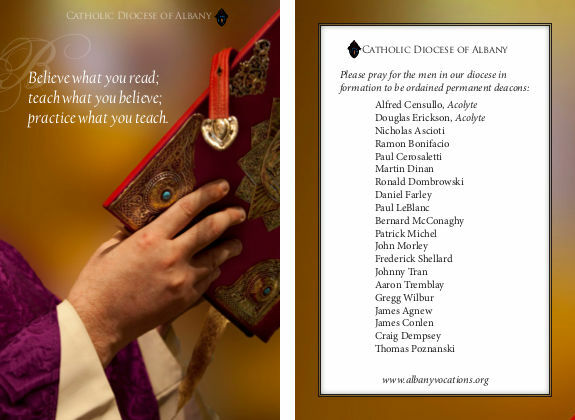 These men have submitted their names for discernment with the Diocese of Albany. Of those 108 men 33 of those men are in the Formal Formation Process. We currently have 18 Seminarians and 15 Aspirants. The Roman Catholic Diocese of Albany currently uses 6 Seminaries for Formation. The St. Isaac Jogues House of Discernment: Is a propaedeutic program Discerners and Aspirants to help them prepare to enter Seminary. This propaedeutic program focuses on the four pillars of Formation as outlined by Pope St. John Paul II in the encyclical Pastores Dabo Vobis. The men study the Program for Priestly Formation which has been promulgated by the United States Conference of Catholic Bishops. This is a two year program which also studies the church documents, Lumen Gentium, Gaudium Et Spes, Presbyterorum Ordinis and other church documents as well as the Theology of Ministry Ecclesiology and Christology. We currently have 9 Aspirants in our First-year program and 5 Seminarians and Aspirants in our Second-Year program. The ultimate mission of the St. Isaac Jogues House of Discernment is to help a man discern if he is called to ordained ministry as a priest for the Roman Catholic Church. The Vocations Team Regional and at Large Representatives assist the Vicar for Vocations in the area of recruitment and discernment. The Vicar for Vocations meets with the Team on a regular basis to plan out recruitment strategies for vocations, develop programs for discernment and support for those contemplating a priestly vocation. They run the individual regional at large vocations discernment groups, meeting on a regular basis for those who are discerning. They communicate with the Vicar for Vocations on the progress of the discerners. The Vicar for Vocations periodically attends the regional discernment group meetings. The Vocations Team Regional Representatives also network with the priests in their regional areas to help support vocations in the local parishes. There are 6 Vocations Team Regional Representatives and One at Large Representative for International Vocations. Fr. 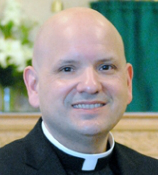 Brian Slezak: Assistant to the Vicar for Vocations: Pastor, Holy Trinity Parish 122 Vliet Blvd. Cohoes, NY 12047, slezakb@gmail.com (Region 1) Representative for the City of Albany, Colonie, Southern and Western Suburbs. At Large Representative for discerners ages 16-20. Fr. Francis Vivacqua: St. Mary’s Church 167 Milton Ave. Ballston Spa, NY 12020 francis.vivacqua@rcda.org (Region 2) Representative for Northern Albany County, Northern Rensselaer County including City of Troy, and Southern Saratoga Counties including City of Saratoga and Village of Ballston Spa, Eastern Schenectady County including City of Schenectady and Suburbs. Fr. Matt Wetsel: Our Lady of the Valley Parish 11 Wells Ave. PO Box 311 Middleburgh, NY 12122, Matthew_Wetsel@hotmail.com (Region 3) Representative Herkimer, Fulton, Montgomery Counties and Western Schenectady County. Fr. Scott Van Derveer: St. Mary’s Church Coxsackie 80 Mansion St Coxsackie, NY 12051, (St. Patrick’s Ravena) scottvanderveer75@yahoo.com Regional (Region 4) Representative for Southern Albany County, Southern Rensselaer County, Columbia and Greene Counties. Fr. Rendell Torres: Our Lady of Hope Church 9-Wheeler Ave Whitehall, NY 12887, fr.rendell@gmail.com (Region 6) Representative for Northern Saratoga County, Warren and Washington Counties. Fr. Quy Vo: St. Anthony and Joseph’s Church Herkimer 228 South Main St. Herkimer, NY 13350 (St. John the Baptist Newport) Phone: Quyvo04@gmail.com International Seminarian Candidates Representative. Joseph Aini Seminarian: Second Year Program, St. Isaac Jogues House of Discernment. Samuel Bellafiore Seminarian: Third Theology, St Joseph’s Seminary Dunwoodie, Yonkers, NY. Jose Alexander Castano Aspirant: First Year Program, St. Isaac Jogues House of Discernment. Russell Bergman Aspirant: Second Year Program, St. Isaac Jogues House of Discernment. Deacon Zach Chichester Seminarian: Fourth Theology, St. Mary’s of the Lake Mundelein. Tuan Cao Aspirant: College/ Pre-Theology, Cathedral Seminary Douglaston, NY and St. John’s University Queens, NY. Matthew Duclos Seminarian: First Theology, Pontifical North American College, Rome, Italy. Kyle Eads Seminarian: Third Theology, St. Joseph’s Seminary Dunwoodie, Yonkers, NY. Adam Feisthamel Seminarian: Pre- Theology, Our Lady of Victory Church Troy, Fr. Randall Patterson Supervisor; 2017-18 Pastoral Year Placement. Nicholas Fiacco Aspirant: First Year Program, St. Isaac Jogues House of Discernment. Kyle Gorenski Seminarian: Second Theology, St. Mary’s Seminary, Baltimore. Matthew Houle Seminarian: Second Theology, St. Mary’s Seminary, Baltimore. Marcin Jankowski Aspirant: First Year Program, St. Isaac Jogues House of Discernment. Joseph Keagle Aspirant: First Year Program, St. Isaac Jogues House of Discernment. Frandy Martinez Aspirant: First Year Program, St. Isaac Jogues House of Discernment. James McGinn Aspirant: First Year Program, St. Isaac Jogues House of Discernment. Daniel McHale Seminarian: First Theology, Pope St. John XXIII, Weston, MA. Anthony Duyet Thanh Nguyen Seminarian: Pre-Theology, Cathedral Seminary, Douglaston, NY and St. John's University, Queens, NY. Peter Thien Van Nguyen Seminarian: Second Theology, St. Joseph’s Seminary, Dunwoodie, Yonkers, NY. Charles Onyeneke Seminarian: Second Theology, St. Mary’s Seminary, Baltimore. Hien Pham Aspirant: College/ Pre-Theology, Cathedral Seminary, Douglaston and St. John’s University, Queens, NY. Joel Parkyn Aspirant: First Year Program, St. Isaac Jogues House of Discernment. Jay Pregent Seminarian: Second Year Program, St. Isaac Jogues House of Discernment. Nathaniel Resila Seminarian: First Theology, St. Mary’s of the Lake, Mundelein. Joseph Rossi Aspirant: Second Year Program, St. Isaac Jogues House of Discernment. Dai Van Tran Aspirant: College/ Pre-Theology, Cathedral Seminary, Douglaston and St. John’s University, Queens, NY. Thomas Yakalis Aspirant: College/Pre-Theology, Siena College, Loudonville, NY. Stephen Yusko Seminarian: First Theology, Pontifical North American College, Rome, Italy. Seminarians are those who have been officially accepted for Formation to the Priesthood; Aspirants are those who are in the Discernment process at the St. Isaac Jogues House of Discernment; Seminarian Candidates are those in the application process to become a Seminarian. Pastoral Year placements are designated for Seminarians who have already begun their Priestly Formation and who reside at the Parish where they are assigned. Pastoral Placements are for the men who will be participating in either the First Year or Second Year of the St. Isaac Jogues House of Discernment Program in Watervliet. The Vocations Awareness and Youth Ministries are very excited to offer the opportunity to our youth to hear firsthand the experiences of individuals who have journeyed through the process of discerning their chosen vocation. Remember to pray for our Seminarians! Click on the image to open a PDF version of the card! Feel free to post these on your website, social media, or parish email list to help promote vocations to the priesthood and religious life! Remember to Pray for our Permanent Diaconate Candidates! Request additional (free) vocation resources! 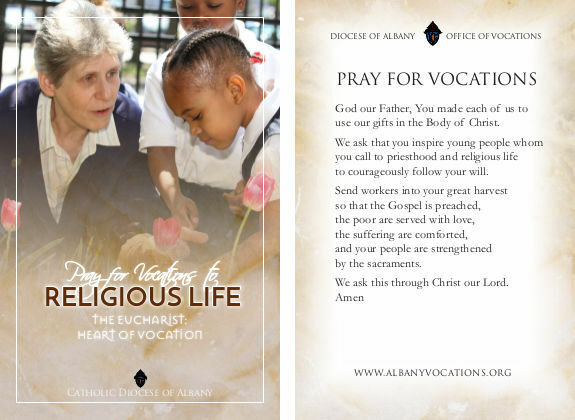 Did you know that you can request additional copies of our seminarian and religious life posters and cards, as well as the Vocation Lessons brochure and the Six Ways to Discover My Vocation Card? The St. Isaac Jogues House of Discernment is in need of four volume sets of the Liturgy of the Hours. Please contact Fr. Anthony Ligato. Seminarians and Aspirants will participate in their Parish Assignments or their home parishes.